These are desk-top and rack-mounting intercom stations. They provide a clear overview of many channels and offer a simple interface to listen and talk to selected channels. 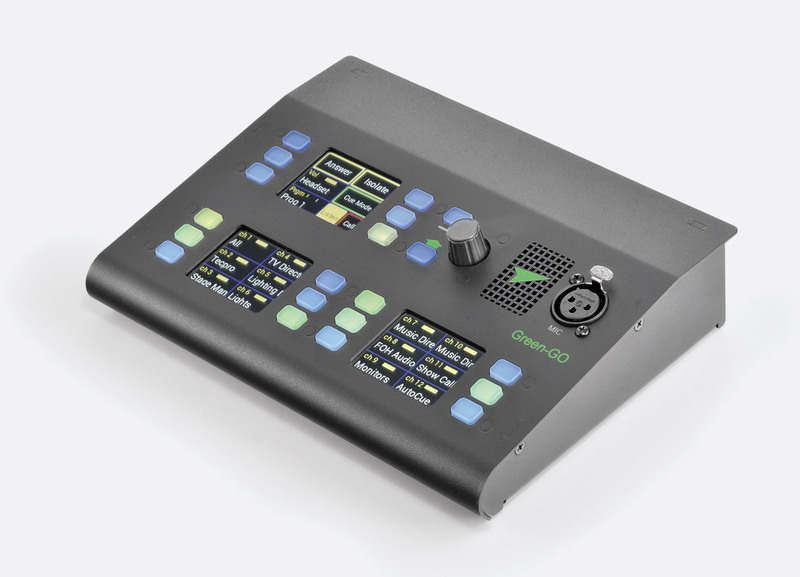 This makes the system suitable for complex live event and broadcast applications where several intercom channels need to be simultaneously monitored while conversing with one or more selected channels. They communicate over the network with other Green-Go digital intercom stations. Each station is connected to a network switch using standard Ethernet cabling. They can be powered over the network if the switch provides power over Ethernet; an accessory power supply can be used otherwise. The use of the term 'Main' station implies that a device can control other devices, for example 'extender' units. Green-Go never use the term 'Master' station as it implies that it is a form of base station which, uniquely, they do not use. The MCX is a rack-mounting intercom station, occupying 1U of a 19-inch rack with a depth of only 110mm. Channel labels and audio level are displayed via the three, six-channel, TFT touch screens. The audio level of each intercom circuit can be adjusted for best intelligibility. Full duplex communication is by headset or the in-built loudspeaker and optional gooseneck microphone. The MCX can be configured to suit system requirements: Intercom channels and system functions will typically be spread over two pages. Page selection is by a single button press. Important intercom channels and functions that need to be constantly monitored, can be copied to both pages. The number of fields dedicated to intercom channels will depend on the quantity of system functions required and the number of intercom channels and functions copied to both pages. Typical intercom channel numbers will be around 20. For larger systems, 24 channel, extender units are available. Up to 9 extender units can be linked to a MCX or MCXD multi-channel station. Intercom channels are presented in banks of six and each channel is controlled by a combination of an microphone on/off switch with LED and a TFT touch screen. The LED switches offer latching and non-latching modes, depending on the duration for which they are pressed. Each microphone switch illuminates orange, green or red (blinking) to indicate talk to the channel, talkback from the channel or 'Call' signal received. The TFT touch screen controls several functions including channel 'Listen/Mute', 'Call' (to a group or individual) and 'Cue' mode. When several channels are calling in to the MCX station, all can be addressed simultaneously by pressing the 'Answer' key. Releasing the 'Answer' button allows individual channels to be selected for conversation. To reduce unwanted chatter during important discussions, the 'Isolate' function will mute all intercom circuits that are not part of the conversation. Multi-channel stations may be powered by PoE (Power over Ethernet) or an external 12V DC power supply. The rear panel offers two Ethernet LAN sockets with built-in 100Mbit switch. Port 1 will accept PoE. Port 2 is un powered and is suitable for connecting to an Extender unit or a computer. Analogue audio can be injected into and extracted from the communications network via a single male and female 3-pin XLR connector. Two channels of general purpose input output (GPIO) connections are available on a 9-pin D-sub connector, providing opening and closing contacts for external control interfacing. 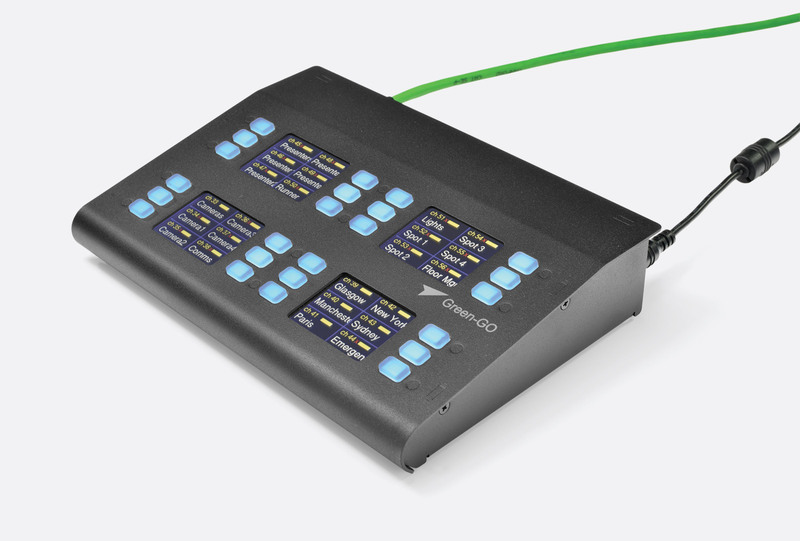 A basic but useful cue-light system can be controlled from any MCX or MCXD main station. One or more Group or User can be selected for cueing. Selected channels can be simultaneously or separately cued to 'GO'. This has similar features to the rack-mounting station. Despite the large number of available intercom channels and functions, the footprint is remarkably compact, 220 x 160 x 45mm. These are used in conjunction with an MCX or MCXD Main Station to provide extra capacity, each providing 'direct access to 24 extra separate users or groups through individual multi colour push-buttons'. The extender operates as a slave device to the Main Station and up to nine extenders may be connected to a Main Station by loop-in, loop-out cabling. These 24-channel extender units are compact, occupying 1U of a 19-inch rack with a depth of only 110mm. Sharing many features of the MCX Main Station, they provide a clear overview of many channels and offer a simple interface to listen and talk to selected channels. Set up is controlled from the linked Main Station. Extender units can be configured with intercom channels (only) as required. they can not be programmed with 'functions'. The extenders have no connections for a headset or microphone; the audio is via the main station.The rear panel offers two Ethernet LAN sockets with built-in 100Mb/s switch. Both sockets are unpowered. MCX-EXT Extender Units can not receive PoE so must be powered by an external 12V DC power supply. Similar in size to the MCXD Main unit, this has the same functionality as the rack mounting MCX-EXT Extender. The 4-pin, male, XLR headset connectors are compatible with headsets with an impedance greater than 32 ohms and fitted with mating connectors such as those from Tecpro, Beyer and many other brands. If the microphone type is electret, switchable bias voltage is available to power the capsule. Where the intercom station has a 3-pin female XLR connector for a microphone, Canford CxxxXB24 types are suitable. See: Canford Condenser Gooseneck Microphones'. Switched 12V DC phantom power is available to power electret microphone capsules.